Most red bumps on the eyelids are chalazia (singular: chalazion), which are inflammatory bumps resulting from blocked oil glands in the eyelids. Each eye has dozens of oil glands, with outlets near where the eyelashes emerge from the eyelids. These oil glands produce an oily secretion that is one of the normal layers of the tear film. If one or more of these glands gets blocked up, an inflammatory bump forms in the eyelid. 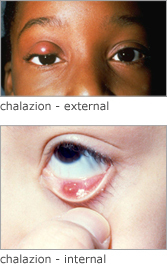 This bump, called a chalazion, is not an infection, but instead is the body’s response to the blockage. The single best treatment is warm compresses, but occasionally steroid injection or even surgical excision may be needed. There are other causes of red bumps in the eyelids, and some of them can even represent serious problems, so if compresses do not make the bumps on the eyelids go away, see an ophthalmologist.